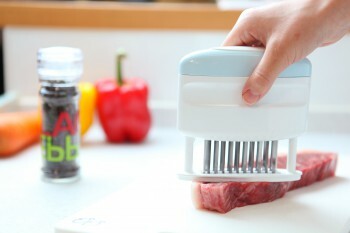 You’ve never tenderized steaks before? No problem! 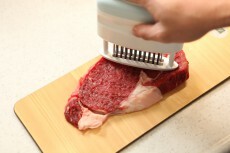 Using niXaX is very simple: You just lay a cut of steak on the cutting board, then push it from left to right! One side is done in just 10 seconds. 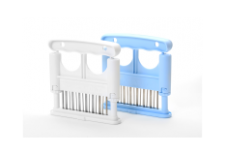 Unlike other meat tenderizers, the Blades of niXaX are arranged in an “X” shape, which enables you to “crisscross” holes across the meat that cut through tough connective tissues. Because the holes are “crisscrossed”, you can easily recognize that the blades are uniformly tenderizing. You want steaks that are even more tender? Flip the steak and repeat. Easy! The edges of the niXaX Blades have a very unique shape. 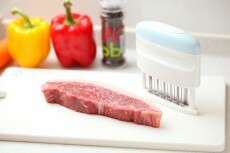 While other meat tenderizers have blades shaped like knives, the edges of niXaX blades are crafted in a “U” shape. 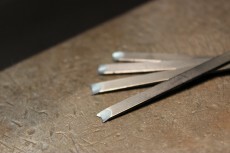 It provides an absolute cut between U shaped prongs. Why did we craft them in these shapes? Because our company is the No. 1 chiseling company in Japan and edges like this are our specialty. The arrangement of the niXaX blades makes us stand out against other tenderizers. They are laid out in an ”X” pattern. With this unique arrangement, you can easily make ”crisscross” incisions. 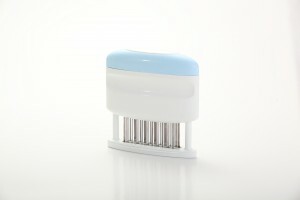 Are you worried about the edges stabbing into your cutting board and damaging the blades? No need to worry. Here’s how we overcame the problem. niXaX has 2 guide pins that are a little bit longer than the blades. So the pins touch the cutting board and the blades NEVER stick into the board! It ensures long lasting tastes of the sharpness.